Occupying river valleys, flanked by hills, cliffs and mountains, Msinsi Resorts and Game Reserves naturally have a wide range of habitats - which in turn means a wide range of plants, mammals and insects. Birds thrive in these green refuges which allow them to escape metropolitan expansion. All Msinsi reserves are perfect for birders who want to hone their skills or those visiting the region who want to check out some KZN specials or interesting migrants. Be especially sure not to miss . . .
Albert Falls Dam and Game Reserve: Fish attract more than human fishing enthusiasts – also look out for the African Fish Eagle Osprey, Cormorants, Darter, Goliath, Grey Heron and the Great White Egret. The also boasts summer’s migrant warders such as Ruff, Greenshank and Avocet, foraging around the dam shore. Look in the grasslands for secretary birds, Longclaw and Stanley’s Bustard. the thornveld is often buzzing with Shrikes, Scrub Robins, Barbets, Sunbirds and Orioles. Enquire about about booking a night drive if you’d like to view Owls and Nightjars. Nagle Dam and Game Reserve: In glades of trees, green spotted Pigeons search for fruit, in summer, you’ll love the plum-coloured starling’s rich plumage. Look for the bright flash of the Malachite Kingfisher or listen in the bushveld for the call of the Brownhooded Kingfisher. Watch at dawn or dusk for the swift but deadly hunting flight of the African Goshawk. Hazelmere Dam and Resort: Birding here is as easy as sitting in your camp-chair beside the dam. Enjoy the sight of our resident pair of giant Kingfishers scanning for food from a branch over the water. Often you’ll catch the spectacular sight of them hovering briefly before they plunge into a dive after their prey. Watch out for Waxbills, Firefinches and other Seedeaters amongst the grassveld as well. 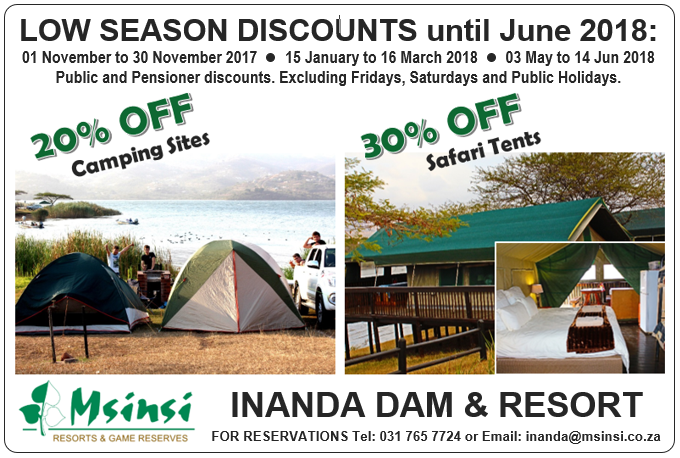 Inanda Dam and Resort: You’ll usually be treated to the sound of Africa - the ringing, far-carrying call of the African Fish Eagle, a fairly common resident. Either when perched or in the air, it calls aweee-ah, hyo-hyo-hyoa or aheee-ah, heee-ah, heeah-heeaha. This is usually a signal that a pair is looking for their kill so get out your binoculars, take a seat in the campsite or day visitor area and watch the hunt.